Having servants may have been a luxury, but part of the cost was loss of privacy. Until well into the eighteenth century, there was no easy way to summon them from another part of a large house. A servant would therefore stay in the room with their employers, or just outside the door, so that they could be quickly called when needed. Only in 1744 was a bell system invented, enabling servants to be in other parts of the house until rung for. By the nineteenth century, such systems had become standard in larger households. They were familiar enough to Victorian readers for a bell-pull to play a key role in the Sherlock Holmes story The Adventure of the Speckled Band. 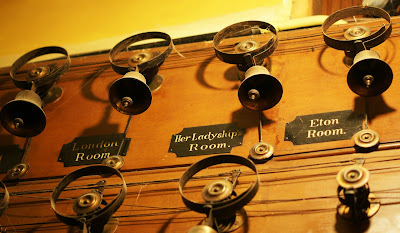 The board of labelled bells pictured here is in Tyntesfield, a Victorian mansion in North Somerset. As electrical systems progressed, more modern systems would have smaller boards indicating which bell had been rung and a discreet button instead of a bell pull. Such a convenience as a table bell is an unknown article of furnishing. Should the servant by any chance be wanted when out of the room, even at dinner, the mistress will rise from her chair and cross to the mantel, by the side of which is an electric button or bell pull communicating with the kitchen. "I felt my bolster lift up my head; I thought somebody was getting from under my bed, but soon found it was a strong earthquake, that lasted near half a minute, with a violent vibration and great roaring. I rang my bell; my servant came in, frightened out of his senses: in an instant we heard all the windows in the neighbourhood flung up. I got up and found people running into the streets, but saw no mischief done: there had been some; two old houses flung down, several chimneys, and much chinaware. The bells rung in several houses." I'm writing a thesis about mechanical house bell systems and I've had a bit of trouble nailing down the date of their invention as well. However, I found an earlier reference to house bells in Tessa Murdoch's Noble Households: Eighteenth-Century Inventories of Great English Houses. She found spring-mounted house bell equipment in the 1727 probate inventory at Kiveton House in Yorkshire. Since bell systems rely on springs for their operation, my best guess dates their invention to the late 1600's, after physicists discovered the mechanical principle behind the spring and began using springs in clocks. The clock balance spring looks quite similar to a house bell spring. Thank you - and what great detective work! It's a lovely topic for a thesis. I really like your picture of servants' bells, and I was wondering if it would be possible to use the picture on my website? I am creating a site for my mother-in-law who is opening up her house for weddings. I thought the image would be fun to have in the "contact us" section. Her home used to have servants bells - there are still one or 2 dotted about, but there is no longer a board full of them, like in your picture. 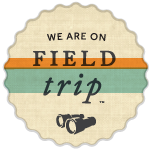 I would love to use the image on our site (which is not yet up otherwise I'd give you the url! ), but I understand if you would rather not. My email is info@purtonhouseweddings.co.uk.